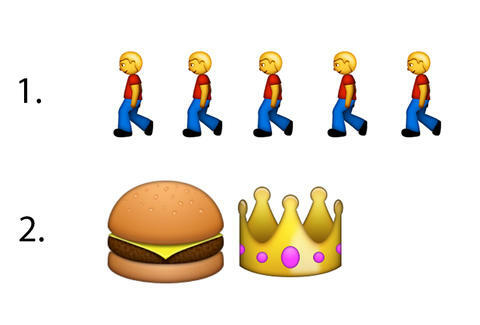 Can You Guess the Emoji Burger Chain? Emojis are increasingly being embraced as a new form of punctuation, a valuable shorthand used to spice up informal conversations and convey larger concepts with fewer finger movements. It's like the 21st Century equivalent of Hieroglyphics, except with little googly-eyed poop characters apropos of nothing. With that in mind, we tried to translate the names of 13 well-known burger chains into pure emoji-speak. Some are obvious, while others are a testament to the fact that our vocabulary's still pretty limited at this point -- even with the addition of a taco. Don't worry, there's an answer key underneath if you're truly stumped. Think we missed an obvious one? Let us know in the comments!